1. Pick a song you like. A lot of couples we speak with ask the question ‘can you dance to this song?’. We can help you dance to anything at all, we can make anything work. We have had couples dance to U2, Muse, Christy Moore, the ever popular Ed Sheeran and we have even had a song from the Muppets!!! 2. Pick a comfortable shoe. I get it… I’m a massive shoe lover myself, I own a pair of Louboutins and I ADORE them but I would never subject myself to a whole day in them!! You are literally on your feet all day and to top it off you have to DANCE in them at the end of the night. Also if you are going for a dance lesson, try and wear a shoe similar to what you will wear on the big day to give you a feel for it. 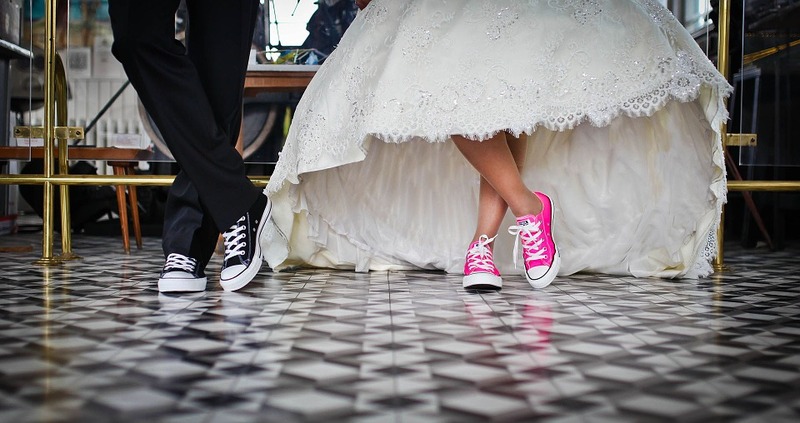 Practising in runners isn’t ideal unless you’re a totally trendy bride wearing converse on the big day (we’ve had lots of these lately). 3. The dress: If you are going for a big princess style dress you really won’t be moving too much during the first dance, some simple movements in the centre are perfect for a dress like this. The same goes for fitted dresses, you can be quite restricted and hiking your dress up to dance won’t look good in those photos. I attended my friend’s wedding last year and put together a beautiful first dance but her dressmaker hadn’t added in a clip for her train… Every step back meant she stood on the dress! I always ask the bride to describe her dress to me before a lesson as it gives me an idea of what she can and can’t do. 4. Don’t leave it until the last minute. I seem to get more and more panicked phone calls consisting of “I’m getting married next week and we can’t dance”. Try to do a lesson or two a couple of weeks before as you will be a lot more relaxed, the week of the wedding is rarely a good idea as tensions can be high. We recommend 1 or 2 lessons (1 hour each) to accomplish something simple and effective. If you are looking to tackle a big YouTube performance you will need to allow at least 3 – 4 lessons depending on content. Every year without fail we have requests for Dirty Dancing but please bear in mind this takes a lot of hours with us and practice and dedication at home to achieve (but it can be done, we’ve seen it). 6. Enjoy it and smile… everyone is looking at you from the waist up so don’t stress too much about two left feet, they won’t even notice. Practice makes perfect! Nothing beats a bit of practice to help you feel more confident and comfortable so move the couch out of the way and get practising. Don’t worry about making mistakes. You and your partner are the only ones who know your routine so your guests will be none the wiser if you forget a twirl or two. The last thing you want on the Big Day is to be stressing over dance steps so keep your routine nice and simple unless you plan to put in lots and lots of practice. The size of your dance floor may determine the type of routine you do – you might not have enough room for a five-step routine if you’ve only a small space to work with.